"The Ogo-Pogo: The Funny Fox-Trot"
↑ 2.0 2.1 2.2 ETVids101 (2016-02-19). "DESTINATION TRUTH - SPIRITS OF ANGKOR WAT AND CANADIAN LAKE - Discovery Paranormal Supernatural". Destination Truth. สืบค้นเมื่อ 2016-09-29. Gaal, Arlene (2001) In Search of Ogopogo. Hancock House, Surrey, B.C. 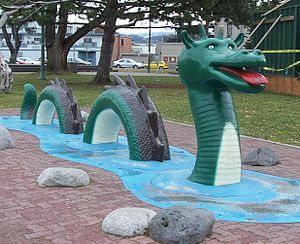 Gaal, Arlene (1986) Ogopogo: The True Story of The Okanagan Lake Million Dollar Monster. Hancock House, Surrey, BC. Moon, Mary (1977) Ogoppogo. Douglas Ltd., North Vancouver, Canada. Nickell, Joe (2006) "Ogopogo: The Lake Okangan Monster". Skeptical Inquirer, 30(1): 16–19. Radford, Benjamin (2006) "Ogopogo the Chameleon". Skeptical Inquirer, 30(1): 41–46. Salmonson, Jessica Amanda (1992) The Mysterious Doom and Other Ghostly Tales of the Pacific Northwest: 149. Sasquatch Books, Seattle, WA. หน้านี้แก้ไขล่าสุดเมื่อวันที่ 1 ตุลาคม 2559 เวลา 09:45 น.